The Art Space at Cass Art Glasgow aims to support local artists with regular exhibitions and events - and this month we're delighted to host 6 in the City, an exhibition of work by six recent graduates from Glasgow School of Art. The six artists all studied Communication Design, which is evident in their diverse range of works, differing in both scale and media. 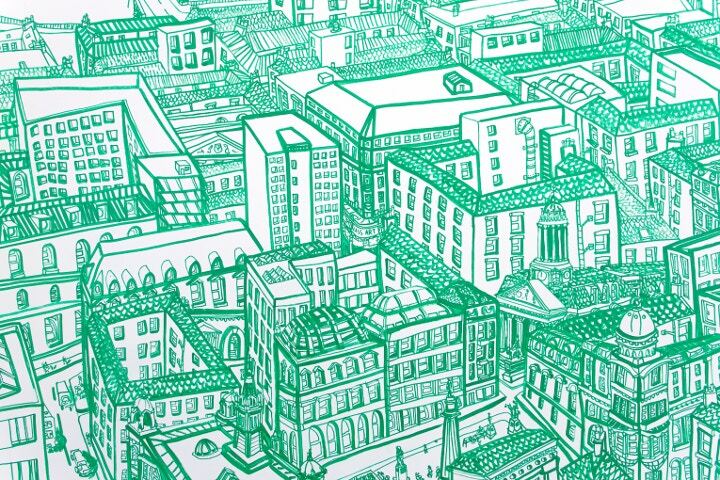 Come on down to see works by artists Hannah Nixon, Jessica Taylor, Ianthe Appleton, Sam Russel Walker and Ruth Kirkby and a captivating, panoramic, large scale wall drawing of Glasgow by artist Chelsea Frew. We caught up with Chelsea to find out more about her time in Glasgow and what inspires her illustrations. Hi Chelsea! So tell us about your time at Glasgow School of Art? I studied Communication Design. After 2 years of study the course allows you to specialise in a specific discipline, and I chose Illustration. This allowed me to spend time focusing purely on the development of my work and interests. How long since you finished there and what have you been up to since? I graduated this year, and have since dedicated my time to private commissions and waiting on getting my studio space at the MANY studios development. I am hugely looking forward to getting into my new space and cultivating new work. Can you tell us about your drawing on the walls of the Cass Art Glasgow Art Space? My main influences stem from observations and places that I have spent a large amount of time in. This has allowed me to construct the cityscape from memory. For this mural I have used the details of the grids and tenements contrasting alongside modern high-rises, to Glasgow’s most recognised and iconic buildings. I also wanted to give a feeling of the hustling and bustling city that I know. For this mural I used waterbased POSCA pens for the first time. I enjoyed experimenting with the pressure of the pens to create depth and definition to the buildings. 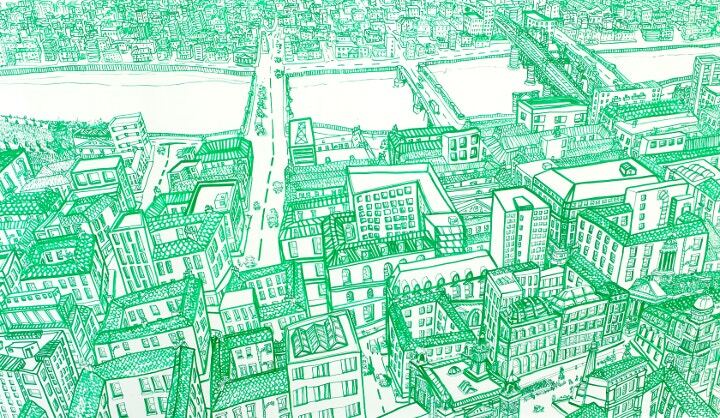 Your drawings are often Glasgow specific – did you grow up here? I have only lived in Glasgow since I started at GSA, but the city has heavily influenced my work. I draw from my imagination, trying to capture the feeling of the city. I have a strong understanding of perspective, so this allows me to interpret the different styles of Architecture. Through the different cities and countries I have travelled, I have observed and studied the various details of the architecture, from Tudor, Georgian, Brutalist and ultra modern skylines. I also enjoy documenting the small details I find within the every day. I plan to stay in Glasgow and focus on my freelance and private commission work. Once I have settled into my new studio space I’d like to put on a solo show of some of the pieces I am currently working on at home. I also plan to help out Jan Kilpatrick on her courses, by leading some lessons on freeing up your drawing, which takes place in Elphin and The Summer Isles in the summer months. Come and see 6 in the City at Cass Art Glasgow - admission is free and the exhibiton is open until 29th November. Visit Chelsea Frew's website here.